Framingham, MA – The new Bose PowerShare adaptable power amplifier line consists of three 1U models: 2- and 4- channel fixed-install models (PS602 and PS604) and one 2-channel portable amplifier (PS602P). Each model delivers 600 watts of power that can be shared across all output channels. With support for both low- and high-impedance loads up to 100V, PowerShare amplifiers adapt to a wide range of applications. Onboard configurable loudspeaker processing and direct access to zone controllers eliminate the need for an additional signal processor in many installations, while outstanding audio performance and reliability are assured with patented technologies inherited from the field-proven PowerMatch® line. This unique set of features and technologies makes PowerShare one of the most versatile high-performance amplifiers available today. Patented PowerShare technology allows asymmetrical sharing of total amplifier power across outputs. Instead of selecting amplifier power based on the needs of the largest zone, installers now have the flexibility to use total amplifier power in the application. This enables more flexibility during the initial design, or later on-site when making unplanned changes that take advantage of surplus power. 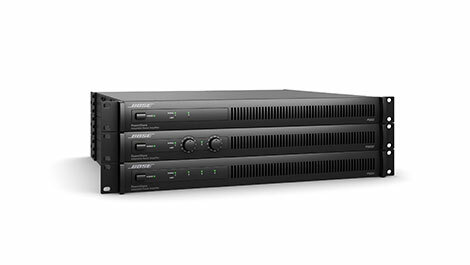 PowerShare amplifiers employ the Dual Feedback Loop (DFL) system, inherited from the Bose PowerMatch amplifier line, improving performance and reliability through continuous monitoring and control of both the current and voltage delivered to each output load. This combination provides improved linearity and lower distortion, while providing loudspeaker protection. Additionally, each channel can be configured for low-impedance (4-8 Ω) or high-impedance (70/100V) applications without bridging, use of jumpers or software settings. “When an integrator is asked to expand a zone beyond the wattage of the amplifier channel, they have to either buy a larger amp, or buy a second amp to accommodate the change. With PowerShare adaptable power amplifiers, all 600 watts can be used across the outputs, allowing installers the freedom to utilize power where needed,” stated Ashraf Elghamrawi, Bose Professional Amplifier Product Line Manager. The new products are being introduced at InfoComm 2016 with market availability expected in July 2016.